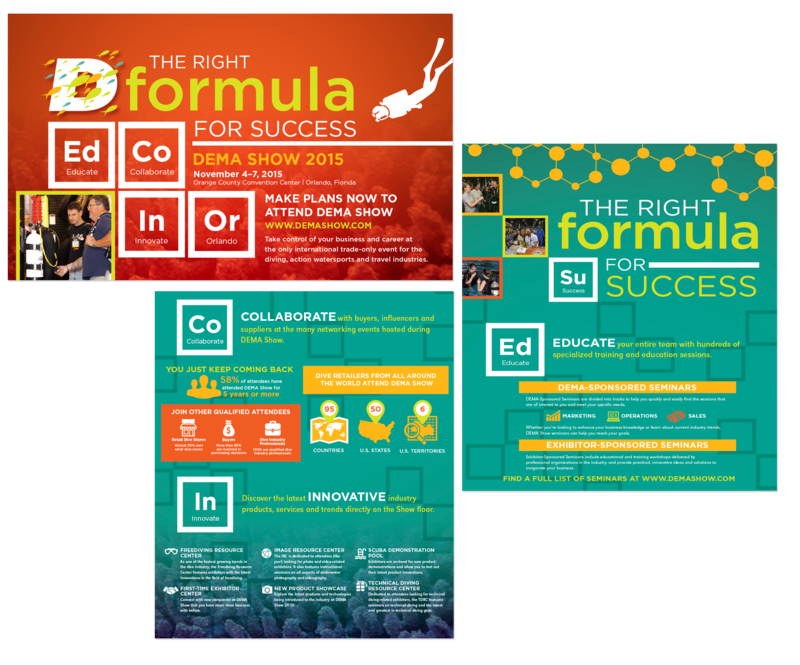 The IAEE Art of the Show Competition’s Attendance Promotion Brochure category evaluates a single brochure (printed or digital) used to promote attendance at a show. Judging criteria includes overall presentation, visual appeal and creativity; organization of the information presented (ease to follow/find information); clarity of information, overall message and content usefulness; how the presentation relates to the overall “theme” of the event; and how well the piece met its intended goals. The AAJ Winter Convention is the American Association for Justice’s annual event that features four days of learning and networking for the nation’s most accomplished trial lawyers and experts. The latest developments in trial advocacy and many specialized topics are covered in a variety of cutting-edge CLE programs designed to help attorneys better represent their clients. The convention attracts more than 1,400 attendees and 70 legal service exhibitors. 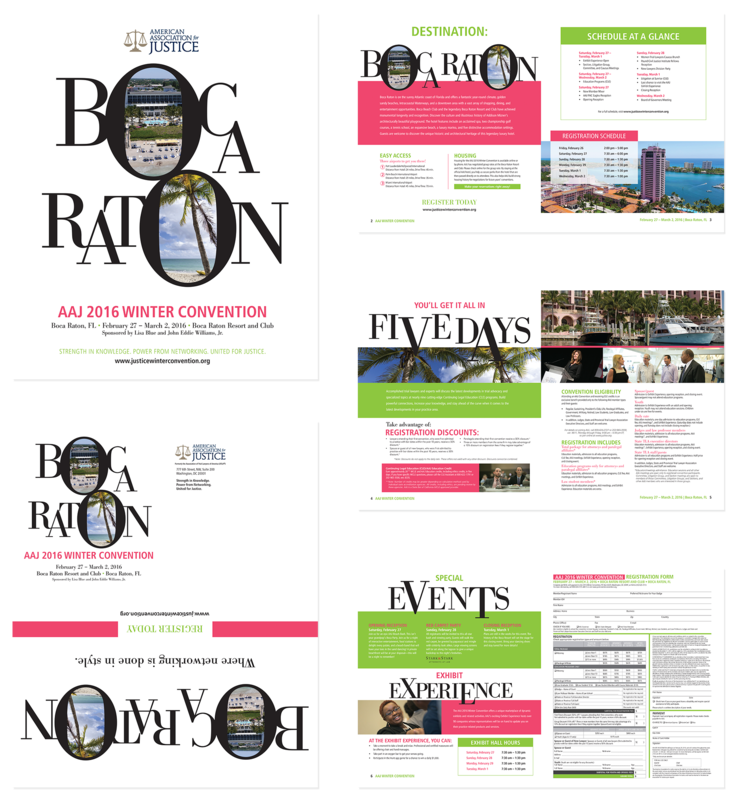 CSG Creative’s goal for the brochure was to drive awareness and registrations for the AAJ Winter Convention. The convention is not only a draw for attorneys, but also as a winter getaway for families. As such, one of the marketing objectives each year is to make sure that the brochure appeals to both audiences. The DEMA Show is held annually by the Diving Equipment & Marketing Association. The largest trade-only event in the world for companies doing business in the scuba diving, ocean water sports and adventure/dive travel industries, it attracts hundreds of exhibitors and thousands of dive and travel industry professionals from around the world. In addition to providing an arena in which to conduct business and network, DEMA Show offers participants the most extensive education curriculum in the industry including DEMA-sponsored seminars and exhibitor-sponsored seminars from participating manufacturers, travel destinations and dive certification organizations. DEMA Show has been dedicated to providing an engaging environment, modeling and fostering an inclusive culture, and providing relevant professional development to further innovation within the diving industry. Those objectives, tied with last year’s campaign, “Expand Your World,” allowed CSG Creative to create a cohesive campaign that shows attendees that this is more than a show – it’s career changing, it’s business-changing and it changes the way they see opportunity. The primary goal of this piece was to drive that concept home. As the piece is unfolded, the story also unfolds with it – laying out the narrative for the attendee that this is a “cannot miss” event. Founded in 1980, Labelexpo Europe is a mature show in a mature market. Held biennially in Brussels, it is the largest event for the label and package printing industry. With a global audience, its exhibitors are machinery/material suppliers and visitors printers who produce labels and packaging for the food, drink and pharmaceutical markets. The show is unusual with its large scale, complex and technical exhibits of live working print machinery. Tarsus Group set the following key objectives for this campaign: increase visitor numbers; promote creative printing technologies; and expand the show by targeting other groups (e.g. flexible packaging). In order to meet them, Tarsus Group threw the conventional rule book out the window by putting a spin on the freedom innovation can allow. The chosen theme broke new ground and subverted the fairy tale genre by showing how technology can solve any problem in the business world. By adopting the strapline – ‘Technology saves the day! The End.’ – Tarsus Group dared its audience to start the next chapter in their business and find the solutions to take them to new heights. The results could only be limited by their imagination.